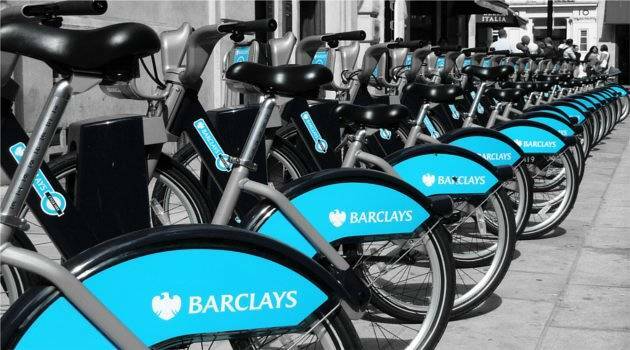 Here in London, we love the cycle hire scheme – or Boris Bikes as they are affectionately known – and the speed and low cost with which we can traverse the city. And more and more tourists are getting involved too, using them as a great way to design their own tour of the sights, away from the crowded underground, busy pavements and tourist buses. We’ve been pondering where else you might be able to do the same, so here’s our list of cycle hire schemes you can enjoy whilst on holiday – and of course a few suggestions for places to check out as well. They’ve been popping up everywhere across London over the past few years, with the scheme spreading even further for the Olympics in East London. All the major transport hubs have their own stations, so as soon as you arrive it’s time to hop on a bike. It’s easy to visit Trafalgar Square, Hyde Park, the Houses of Parliament, the London Eye and head along the Southbank to St Paul’s all in one day with multiple trips. Plus, if you hire for less than 30 minutes at a time you’ll only pay £1 for a day’s hire! 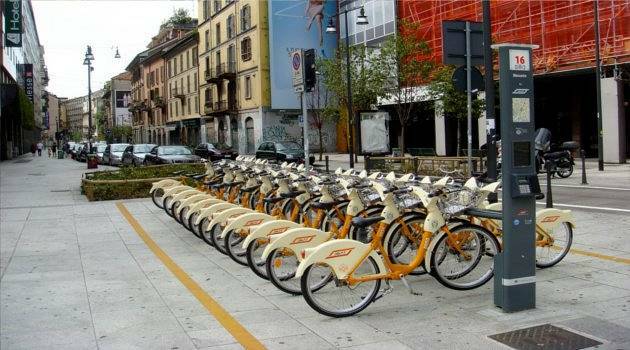 The second largest cycle hire scheme in the world, the success of the bikes in Paris is pretty much the reason that there are so many bike hire schemes around the world today. One-day hire comes in at just €1.70, and you’ll see so much more than if you just hop on and off the metro all day. We suggest starting up at Montmartre, unless you want to have a steep uphill climb at some point, and from there head to the Paris Opera and go south to the Ile de la Cite where you will find Notre Dame. After that, cycle along the Seine past the Louvre, the Musee d’Orsay, the Hotel des Invalides and end at the Eiffel Tower. 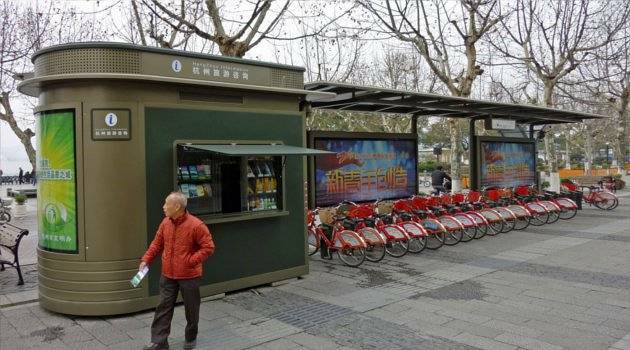 Unsurprisingly, it’s China where you’ll find the world’s largest bike sharing scheme, in the beautiful city of Hangzhou. You’ll have to pay a 200 yuan (around £20) deposit to allow you to access all the bikes, but after that any rides under an hour are free. You’ll probably want to concentrate the majority of your cycling around the West Lake, which is a UNESCO World Heritage Site. It’s a beautiful place, with pagodas and temples dotted around the shore. You can also seek out the Hu Xueyan Residence, cycle to the Liuhe Pagoda and explore the Xixi National Wetland Park. 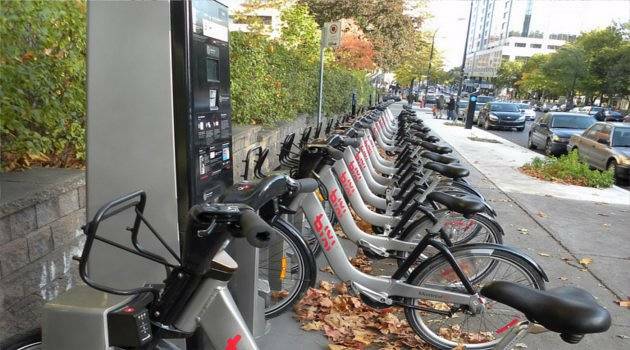 The Bixi system was pioneered here in Montreal , and you’ll recognise it as the one used for the Boris Bike scheme here in London. A one-day hire is $7, with 30 minutes free use each time you get a bike. That’s not quite enough time to get to the top of Mount Royal though, so we suggest you make that trip on foot. On your bike, take in Old Montreal and the port area, and head out to St Helen’s Island, where you can make a stop at the Biome. Then head back to downtown, seek out the miniature Notre Dame Cathedral, and make your way to the arty district around the Modern Art Museum. 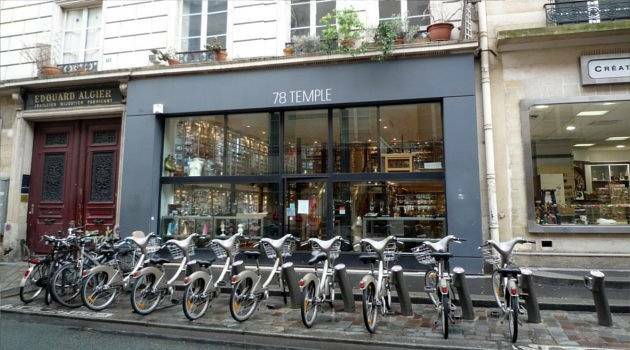 Shopaholics will want to ditch the bike by the underground city! Running from 7am to midnight, you can get a day subscription in Milan for €2.50, making this a rather handy way to cart your shopping from the designer stores to your hotel. Alternatively, we suppose you could also indulge in a little sightseeing. Start at the Piazza Duomo, which is always bustling, and head to the Galleria Vittorio Emanuele II for a coffee. Seek out the Santa Maria delle Grazie for the original of the Last Supper, and then marvel at the posh shops on the Via Montenapoleone, the centre of the shopping district. Castello Sforzesco is an impressive and imposing sight, and make time to explore the Navigli district with its forgotten canals. 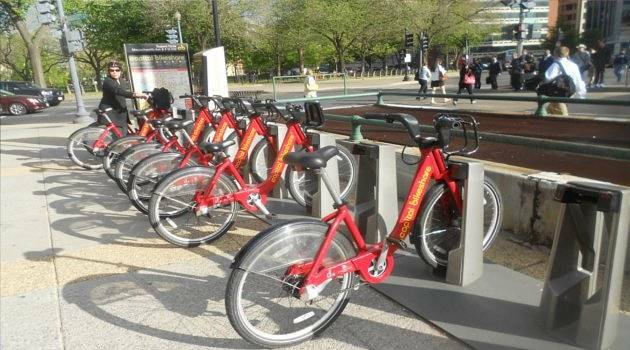 This bike scheme phenomenon has even reached that last bastion of car ownership, the USA! Docking stations here are solar powered and you can get a day’s rental for $7, with up to 30 minutes free each time you grab a bike. You’ll probably want to concentrate your sightseeing efforts around the National Mall – where you’ll find numerous museums as well as the Washington Monument, the Reflecting Pool, the Lincoln Memorial, the Capitol and the White House! You may not go far on each trip, but that’s certainly a lot to cover! Elsewhere, ride around the historic district of Georgetown, and get away from it all with a trip along the Chesapeake and Ohio Canal. Fancy feeling the wind in your hair as you cycle through one of these cities? Then check out our flight and hotel searches! More and more cities are getting schemes like this too, so always keep an eye out for this cheap way to take yourself on a sightseeing tour.